The modelling and management of discrete and continuous phenomena, the need to efficiently and sustainably cope with heterogeneous networks, the possibility to access potentially unlimited hardware and software resources, the inherent levels of uncertainty brought by this vision, the need to elaborate in real time a massive amount of data, all require to develop multidisciplinary knowledge that shall be founded on firm modelling and reasoning capabilities. This is the main aim of our graduate studies with courses that, on one hand, integrate the necessary formal background and, on the other, offer specialized courses to introduce students to the newest developments in the area of Reactive Systems, Software Engineering and Computer Networks. Apart from internal GSSI courses, students are encouraged to take classes also at summer schools or other institutions in Italy or abroad. Each student is asked to prepare, together with the PhD coordinator, a study-plan to be approved by the Scientific Board. Performances in the exams and quality of the thesis proposal (submitted at the end of the first year) are the main criteria for deciding admission to the second year. The second and third years are mainly dedicated to research. Students are assisted by a supervisor and their progress is assessed by an advisory board consisting of experts in the relevant area of their scientific interests. Students are strongly encouraged to spend part of their research studies in external labs in Italy or abroad. We design the PhD courses according to the following three categories. Immigration courses are woven together with a twofold aim: to give the students the tools needed to successfully attend the subsequent courses, and to start to expose the students to relevant research challenges arising in interacting heterogeneous distributed systems. Core and advanced courses are given by top-level international scientists selected among faculties of the most acknowledged institutions worldwide. 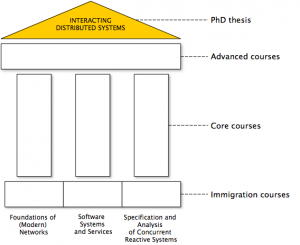 The topics of such courses have been defined to best fit with GSSI – Computer Science research vision on interacting heterogeneous distributed systems.All the courses are meant to provide the necessary background and knowledge to the students for taking up their learning paths towards the defence of the PhD thesis.